Basically a there was kid was able to go into a computer if he did something a certain way. There were other kids who were able to go in. It was live action (for most of it). When they went into the computer they got armor and other things. If you need any more info from what I remember please ask me. High school student Sam Collins is the head of a band (Team Samurai). During a recording session, Sam is zapped by a power surge and disappears, only to reappear seconds later with a strange device attached to his wrist (which is at the time unremovable). Later, after his friends Amp, Sydney, and Tanker leave, one of his video game programs dubbed, Servo, is subject to a power surge and zaps Sam again. This time, the zap pulls him into the digital world and turns him into his creation. As Servo, he roams the digital world and fights monsters called Mega Viruses. Meanwhile Malcolm Frink, another student from Sam's school, is designing monsters on his home computer when Kilokahn (an escaped military Artificial Intelligence presumed dead in the power surge) visits Malcolm via computer screen. Kilokahn strikes a Faustian deal with Malcolm and turns his digital monster into a Mega Virus Monster who is not only capable of corrupting electronics, but is also capable of affecting the real world. Sam (now as Servo) must enter the digital world and stop Malcolm's and Kilokahn's Mega Viruses. Sometimes, when Servo was unable to handle a virus by himself, he would call on the help of his friends using his Arsenal Programs. The Arsenal Programs could fight the viruses solo, transform (with the help of other Programs) and attach to Servo as armor. Since Team Samurai consisted of only 3 people at any one time (excluding Sam), only 3 vehicles were available at any one time. When Servo linked up with these Programs as armor, he changed his name to either Phormo or Synchro (when he combined with Drago or Xenon, respectively). Code Lyoko is a French animated television series that utilizes normal animation as well as CGI. 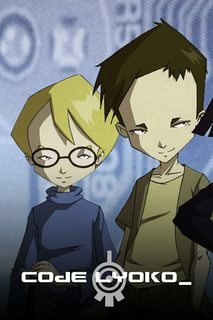 Sponsored by Antefilms and Moonscoop in association with France 3 and Canal J, Code Lyoko follows the adventures of four human children who discover a virtual world inhabited by a diabolical AI, and take it upon themselves to defend Earth from it. They must enlist the help of a pink-haired artificial intelligence to do so, and deal with their double lives as boarding school students at the same time. The series was created by Thomas Romain and Tania Palumbo, and stars Barbara Weber-Scaff, David Gasman, Matthew Géczy, Mirabelle Kirkland, and Sharon Mann. Not the answer you're looking for? Browse other questions tagged story-identification tv or ask your own question. Kids in advanced scifi school novel series?